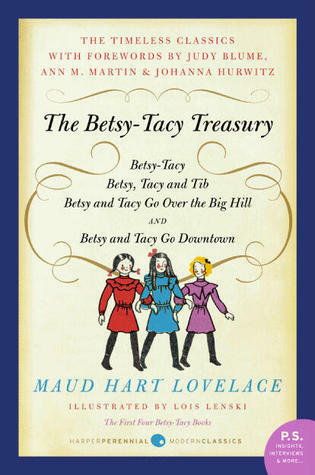 The Betsy-Tacy Treasury by Maud Hart Lovelace, which is the first four books in this 10 book series, was praised by Entertainment Weekly as “a rosy remembrance of a region already known for its niceness.” My daughter and I read these together over many weeks, reading little more than a chapter every couple of evenings. Betsy-Tacy is the first book in the series, and young readers are introduced to five-year-old Betsy who lives in Deep Valley, Minnesota. She lives in a small mill town at the end of Hill Street, but she’s soon to have a new neighbor, as a new family moves into the house across the street. My daughter was thrilled to hear about a girl her age, and she was even more excited when I told her that there were pencil-like sketches inside for her to visualize what we were reading. Transitioning from only picture books to chapter books can be hard, especially for kids who love visuals. Betsy soon has a new friend, Tacy, and they share big imaginary adventures together before her baby sister arrives and before they even meet Tib, whose family is from Milwaukee and live in the chocolate-colored house they covet. Entertainment Weekly‘s assessment of a “rosy” picture of a “nice” little town is highly accurate, and it’s clear that this story takes place some time ago before many worried about strangers, criminals, or had cars, cellphones, and televisions. Imagination was a commodity that children needed in large supply. This is not to say that Betsy, Tacy, and Tib do not get into trouble. Betsy-Tacy and Tib is the second book, and the girls are now eight years old. It becomes clear that even though these books were written during a time when women were supposed to be mothers and wives, these girls have bigger dreams. Betsy is a storyteller and she seems to have dreams of writing books, while Tacy wants to be a mother to a number of kids, just as her mother is. Tib is torn. To be an architect/engineer, mother, dancer, or something else. When kids think about what they want to be when they grow up, their dreams are big and seem to be out of reach. They are fantasies, like many of the stories these girls create in this book for Tib’s Aunt Dolly and themselves. My daughter is riveted by these books and the fun and trouble these girls get into, from visiting the Mirror Palace to cutting chunks of their hair off to put in lockets. These books remind me of the good old days when dreams were interchangeable and wonderful. Betsy and Tacy Go Over the Big Hill is the third book and the girls are now age 10. It’s great how accurate Maud Hart Lovelace captures the competition between young kids when it comes to celebrating birthdays and feeling left out when others have birthday parties and they do not. But, ultimately, everything turns out well between Betsy, Tacy, and Tib, only to have a quarrel between Betsy and Tacy and their older sisters over who will become queen. This book has a lot in it about conflict resolution, which younger kids can definitely use as friendships grow and change, as well as in their relationships with siblings. My daughter enjoyed this one, but was a little unsure of the hubbub about kings and queens, even though she is an avid fan of princesses. I liked the historical details about the Syrian immigrants and foreign affairs involving the King of Spain, as well as a tidbit about the current president being Theodore Roosevelt. However, there are some “old-fashioned” ideas about immigrants and other cultures here that might need further explanation. Betsy and Tacy Go Downtown is the fourth book, and at age 12, Betsy, Tacy, and Tib are a little too old for my daughter. She lost interest in this book series with this book, as their adventures downtown and their prodding of Winona to take them to see the play Uncle Tom’s Cabin did not resonate with her. She’s more interested in make-believe games and stories, and while these girls act as girls probably do at this age, manipulating a classmate is not a lesson I’d like my daughter to learn. It’s also interesting from an adult perspective to see how times have changed — a prized possession for one of the girls is a beer calendar! But here, we also see Betsy grow up and take an adventure to the new library on her own. While she apprehensive, she’s happy to be on her own and she thrives in the books she finds and reads, but also in the attention she seems to receive from others about her own writing. It’s wonderful to see her parents support her writing/art. It’s a lesson that is often not passed on today, as kids are tested and too focused on subjects that will net them lucrative careers. 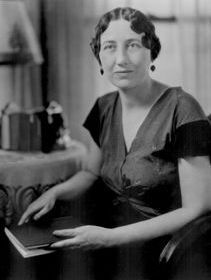 Maud Hart Lovelace was born on April 25, 1892, in Mankato, Minnesota. She was the middle of three children born to Thomas and Stella (Palmer) Hart. Her sister, Kathleen, was three years older, and her other sister, Helen, was six years younger. “That dear family” was the model for the fictional Ray family. Maud’s birthplace was a small house on a hilly residential street several blocks above Mankato’s center business district. The street, Center Street, dead-ended at one of the town’s many hills. When Maud was a few months old, the Hart family moved two blocks up the street to 333 Center. Shortly before Maud’s fifth birthday a “large merry Irish family” moved into the house directly across the street. Among its many children was a girl Maud’s age, Frances, nicknamed Bick, who was to be Maud’s best friend and the model for Tacy Kelly. Tib’s character was based on another playmate, Marjorie (Midge) Gerlach, who lived nearby in a large house designed by her architect father. Maud, Bick, and Midge became lifelong friends. Maud once stated that the three couldn’t have been closer if they’d been sisters.